Over the past few days, there’s not been a lot of cooking going on in my kitchen. Jesse and I have discovered Downton Abbey and have become obsessed. What a truly fantastic show! I adore the characters. And, oh man – the clothes are incredible. We are just finishing up season two and will start season three tomorrow. Have you seen Downton Abbey? Great, isn’t it!? Last night, our leftovers from the weekend (I made Oh My Veggie’s awesome Vegetable Baked Ziti) ran out and I needed to take a quick break from our Downton Abbey marathon to make some dinner for us. I decided to make one of my favourite, easy casseroles, so that we’d have left overs for tonight as well. This casserole is loaded with peppers, chilies, beans and corn and spiced with classic Mexican flavours of cumin, chili powder and fresh cilantro. The casserole is then baked with a cheesy, cornbread topping (reminiscent of tamales) and garnished with some lime crema and avocado slices. It’s hearty, filling and incredibly flavourful. My favourite cornbread muffin mix to use is Bob’s Red Mill Cornbread Muffin Mix as it has great texture and is made with all-natural ingredients. Preheat oven to 400'F. Heat tablespoon of oil in a large saucepan over medium-high heat. Add onion and sauté for 5 minutes. Add red and yellow peppers and sauté another 5 minutes, or until peppers begin to softened. Add beans, green chilies and corn to the pan. Pour broth over the vegetables and reduce heat to a simmer. Stir in 1 teaspoon of garlic powder, 1 teaspoon of ground cumin, and 1 teaspoon of chili powder. Season with salt and pepper. Meanwhile, in a small mixing bowl, combine the cornbread muffin mix (about 1 and 1/2 cups) with 1/8 cup of oil, 1 egg and 1/2 cup of water. Note: the batter should be thick, but still pourable. Add more water if needed. Season the cornbread topping batter with remaining half teaspoon of ground cumin and half teaspoon of chili powder. Fold in 1/2 cup of shredded cheddar cheese and freshly chopped cilantro. Add remaining 3/4 cup of shredded cheddar cheese to the bean/pepper mixture and toss. Pour the mixture into a 10-inch square casserole dish. Spread evenly in the dish and then pour the cornbread topping mixture over top. Smooth topping. Bake in 400'F over for 25 to 30 minutes (or until the cornbread topping is golden). 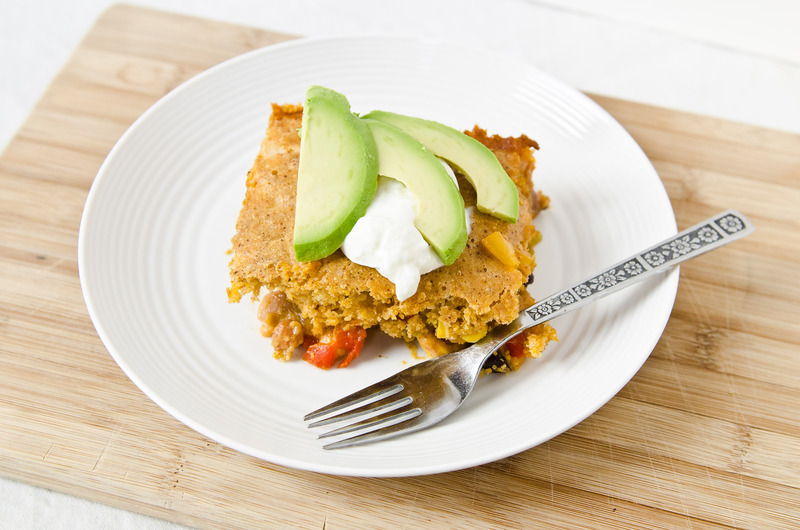 Allow tamale pie to sit for 10 minutes before serving. Garnish with lime sour cream and fresh avocado slices. wow! this is perfection, lady! this is definitely on my “must try” list! We loved the baked ziti! Jesse asked if we could put it on our weekly rotation. And he normally hates pasta with tomato sauce! It’s nice to have a pasta dish loaded with fresh veggies. And I love ricotta. Yum! Wait, was there Cilantro in there?! YUM! You are on a cooking & baking spree – I have heard a lot about downtown abbey, but have yet to watch it- my current obsession is House of Cards, a Netflix Original Series. SO GOOD! This sounds SO good, and the fact that it can be made vegan is awesome. Thanks for sharing :). My dad actually just made a very similar dish for us recently, and I loved it! I think ours used white beans in the filling, which I thought sounded weird, but turned out really well, and the cornbread topping was my favourite part. I can’t remember where he got the recipe from, so I’m glad that I have yours now! This is definitely a much more appealing type of casserole than the ones I usually see! This is totally happening- I love casseroles and I love tamales so I definitely need to try this! Isn’t it awful when you finish all three seasons!? I feel so empty inside now! *haha* I need season 4 to happen ASAP. It’ weird how I miss the characters so much.